After having spent the day exploring Sultanahmet on our third day in Turkey, the old part of Istanbul, my friend and I decided to walk up to Taksim which is Istanbul’s modern district. Walking up to Taksim from Sultanahmet is an entertaining twenty five minute walk as we passed by spice and coffee merchants, shops filled with turquoise ceramics and colourful lokums (Turkish Delight desserts) all the while hearing Avicii and Mumford & Sons playing loudly from someone’s stereo. A few steps away from the noisy merchants, we reached the town square where we spotted the Galata Tower, a historical medieval stone tower that had a line up of people around it. We decided to join the line too as we figured it would a perfect way to get a great view of the city, especially since we were reaching dusk. We reached the top of the tower and headed outside to the wrap-around balcony. 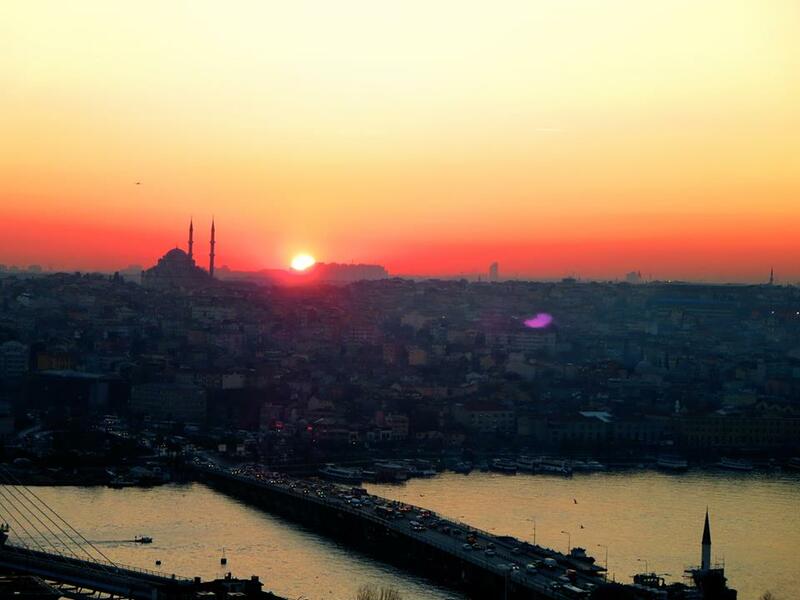 From a distance, the Blue Mosque poked out from the city lights and the fiery tangerine sun was sinking behind it. I was conflicted between grabbing my camera to capture it, or to just actually live in the moment and take in the view. Not wanting to miss the moment, the photographer inside me reached for my camera and after only a few snapshots, the sun had disappeared. At that moment, the call to prayer started from across the horizon and it echoed from one minaret to the other. The entire city resonated with this beautiful sound as the sky turned pink and purple. There were over thirty people on the balcony that just a moment ago exclaimed excitedly at the beauty of the sunset view, but then suddenly everyone had gotten quiet once the prayers started, letting the experience peacefully sink in.